There are few things more satisfying to a regular theatre goer than watching an actor emerge into the spotlight. Go and see enough plays and you soon realise that the same familiar faces keep on cropping up. The personal nature of the theatre – the intimacy of the shared space giving a sense of an assumed connection between audience and actor – can lead to a greater sense of investment and emotional connectivity with the actor than you find in film. Seeing actors like Phoebe Waller-Bridge (Mydidae and Fleabag) or Rudi Dharmalingham (The Events and Oresteia) develop has been the biggest privilege of writing this theatre blog over the last 4 years. To that list it is safe to add the considerable talents of Jade Anouka (Henry IV and The Vote); currently at Soho Theatre with Sabrina Mahfouz’s Fringe First-award winning Chef. 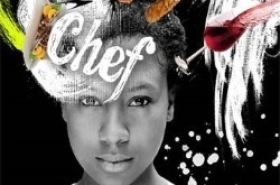 A one-woman show, Chef gives Anouka free range to showcase the considerable skills and highly kinetic performance style that was so captivating as a completely atypical Hotspur in Phyllidia Lloyd’s radical and brilliant Henry IV. As a reviewer there is a lot of trepidation in viewing a one-person show. It needs an exceptionally high level of writing and acting talent in order to keep an audience from start to finish. Without any actors to bounce lines off there is a risk that the show will soon become one-note and tonally flat. A poor script can sometimes be hidden by action between characters but it dies on the mouth of even a talented actor, whilst a poor actor trying to deliver a strong script is one of the more painful theatrical experiences. Sabrina Mahfouz is a recipient of a Sky Arts Scholarship Award for Poetry, and this background may be what grounds the play in the rhythms and structures of performance poetry. Whilst clearly a play, it feels highly sensitive to the flow of language, and is at times more interested in the beauty of language than capturing the naturalism of delivery. It is unlikely that anyone would say “I’d never been in love / but I decided that I’d know when I was / because the man would remind of the way/ seagulls glide out of stalactite clouds, / suddenly, / smoothly, / that’s how he’d find me” but within the show – delivered after describing how she had left her estate and joined her dad on a fishing boat – it is given the dreamy lyrical wonder of someone who has just begun to realise the limitations of her world. Whilst mainly in prose, it occasionally slips into verse, which can cause a little dissonance but actually can be seen as a clever way of forcing the audience to re-engage. It can be difficult to listen to a 50-min monologue and these little dissonances spark the brain and bring us back to the stage action. 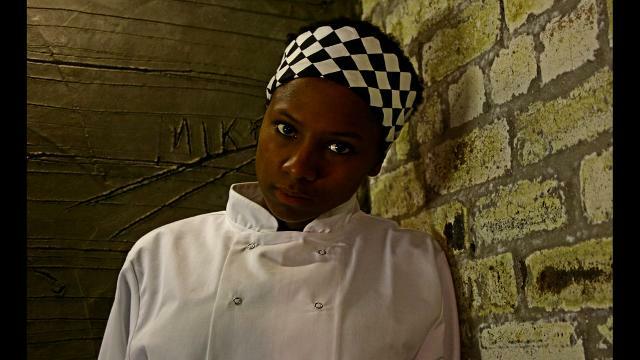 Jade Anouka is well cast in a role that relies on the spiky, combative spirit of Chef. Apart from when Chef talks of food, this is not a performance that relishes in the language unnecessarily. Describing how to create dishes, Anouka develops a distance, a softness in her voice, that suggests the thoughts are taking her far-away. This is cookery as a form of release from the real world. However the narrative is primarily a journey through her past – an explanation of how we got to where we are today. Here the performance relies on Anouka’s energy. Words are thrown forward rather than spoken. There is a staccato edge to the delivery that propels the dialogue. This style gives pace and power to the script. The audience are rarely allowed to settle as images and scenes fly at them. Matching this is the approach to performance; Anouka is rarely still, rather like a boxer she appears on her toes, constantly shifting as if ducking and weaving to avoid return blows. This seems a neat match with the traditional hustle and bustle of a kitchen, as well as Chef’s restless life. Only when it is forced does she seem to settle in one place for long. In parts Mahfouz’s writing is first rate; she brings a poetry to the very real issue of the casual domestic violence and gender dynamic of those living in highly deprived inner cities without underpinning the serious subject matter. The end of Chef’s story on the boat hinges on an unexpected and brutal transition that is heightened rather than diminished by the lyrical approach to description before returning to normality with the sudden cut to ‘I jumped of at the harbour / And didn’t cook again for five years’. It doesn’t all work, and I think it is hindered by an opening section that feels tonally at odds with the rest of the play. The language seems slightly more strained, a little forced. We are introduced by Chef talking about a peach in what feels like a parody of Jamie Oliver but undertaken with complete seriousness. It is unfortunate as it comes in the opening moments and creates a rather false impression about what is to come. However complaining about the opening 3 minutes in a 50 minute monologue is a minor quibble. This is an interesting, lyrical work that boosts solid writing and an excellent performance from an actor who continues to rise through the ranks. I left the theatre enjoying what I had seen, and feeling excited about what they might move onto next.